Siri was considered to be one of the major intelligent systems at the time when iPhone 4S was launched by Apple Inc. But according to the startup company, the features of Siri were declared to be limited because of limited scope in understanding the languages. The original features of Siri involve speech recognition and Apple has successfully marketed the iPhone on the basis of human voice recognition. According to the critics, the features of Sky Phrase are more sophisticated as compared to Siri because they are better in understanding of sentence structure and language rules. There are various critics and experts who have formally researched on the features of Google’s Voice search and action systems and the other related solutions launched by major companies of the world. They declare that Sky Phrase, although a newly launched technology is better than the other available systems. The researchers have made the technology more informed in terms of language and linguistics and it is ensured that it understand it by utilizing the methods, human actually use. Most of the software and speech recognition technologies involve the incorporation of dictionaries in their systems but this is not true for Sky Phrase. According to the methods used for designing the complex technology, the Sky Phrase must be able to realize the complex issues and identify the relationship among syntaxes. In addition to this, it must be fully aware about the correct usage of grammar. The humanistic approach is utilized in the design phase of Sky Phrase so that the in-depth analysis of dictionary is ensured instead of memorization. 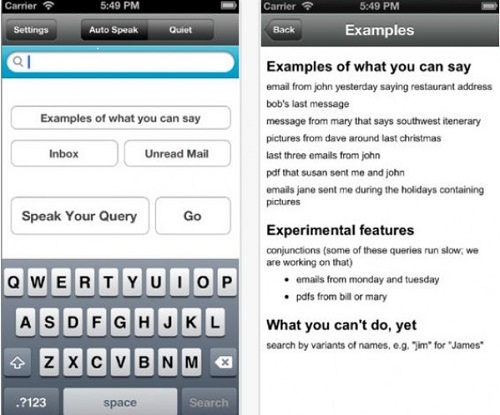 On the other hand Siri technology involves the memorization of dictionary and the related terms in the design phase. There are several intelligent systems which are incorporated in the Sky Phrase voice recognition systems and they effectively recognize the speech patterns and arrange it in a logical way. If the user asks to filter the emails containing photographs, it will carefully analyze all the emails sent during the specified period of time with the photographic attachments. The related schedules, tweets, updates and flight information can also be successfully searched by means of intelligent systems of Sky Phrase. Despite of several advantages the technology announces for it users the one limitation of Sky Phrase is regarding its limited scope. The technology can only search the content required by the user which are available in the contact list. If the information of emailing person is not available in the record of mobile device, it does not provide the desired outcome. But as it is a newly launched technology, users are looking forward for the new features to be incorporated in the systems and each upcoming product as better than the previous one. If someone compares it with Siri, it can be identified that it is not as refined the way Siri is but still it encompass all the relevant features of sophisticated voice recognition systems.